Lifeway. We have one of our own who is looking forward to an opportunity to impact lives and show the light of Christ to another part of the world. Danielle Campos is looking to spend a summer in Santiago, Chile on a mission trip to love, serve and share her faith. She will be sharing with us the details of her trip in the near future. 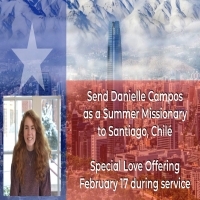 Lifeway Church has set a date aside for us to help out Danielle in her journey to Chile with a special love offering. The offering will be held on February 17 during the church service.